If you're a Yankee like me and go down south, you are going to hear loads of terms and expressions for things that you just don't hear up north. One of those terms is Mens Church Suits. There are some folks who refer to Church Suits as the two piece suits that ladies wear to Church on Sundays with their fancy looking Church Hats and there are many folks who refer to the mens fashion suits they wear on Sundays as Mens Church Suits. They can even be a Double Breasted Suit. These aren't your basic style Mens Suits for business. I feel that wearing a suit to church is the only way to dress. As long as you're wearing a suit. It's disrespectful to go to church on Sunday wearing a pair of jeans. Wearring a Red suit wouldn't be a good idea. Why would you go to church on Sunday wearing the same thing you wear everyday. That to me suggests that you don't find going to your house of worship Sunday a special event. There are churches in more rural communities that don't have the members dressing up but those are few and far between. More the most part the average house of worship has it's members dressing up in their finest. Why else would the expression wearing you Sunday's best come from. How hard is it to wear a mens suit to church anyway? Not very. Plus when you wear a mens suit to your house of worship you'll look great and feel better about yourself. Men originally started to call the fashion mens suits they wear on Sundays as Church Suits because most of suits that many people wear to church are just not made for wearing in an office environment. Suits that one wears for Church usually have some kind of flair and style that you wear with an equally stylish dress shirt and tie. They may have bolder fabric designs or fashion colors and have a longer cut coat. 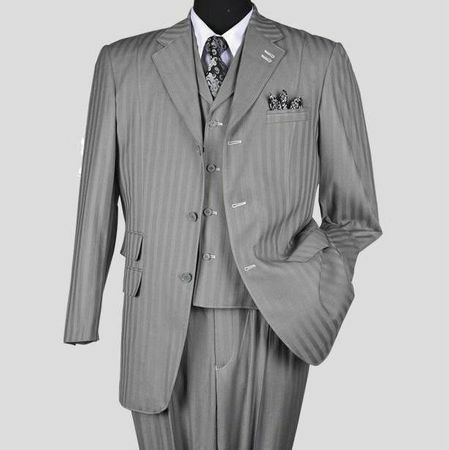 They are fashion styled suits for you to get all dressed up and pay your respects to the Lord on Sunday.